For as long as there’ve been people to visit Death Valley, there’ve been aware of a persistent natural mystery. What is moving those rocks around. Check it out. These aren’t like crop circles. No one’s out there pushing these things around, leaving no footprints. And you can forget alien teenagers out joyriding trying to befuddle the small-brained bipedal apes. This stuff is real. These playas are dead horizontal. So, no solifluction. Aeolian forces? Hardly likely. Any other possibilities? Well, even on extremely gentle slopes ice is capable of moving objects along non-random paths, specifically little spicules. Butzer described it in Archaeology as Human Ecology. It’s one of the many cryoturbation processes known to occur in the frostier places on Earth. But, Death Valley? One of the—and one annum recently the—hottest place on the planet? Yep. Death Valley. It gets cold there in the winter. 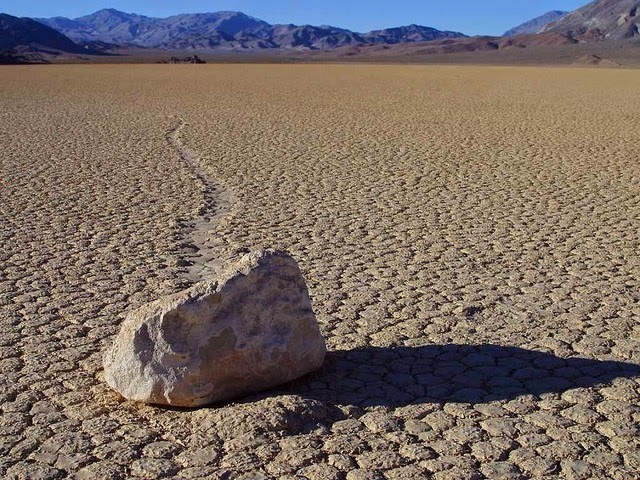 And, now, some poor sods who were braving the sub-freezing days and nights noticed one of these rocks, making its progress across the valley floor.